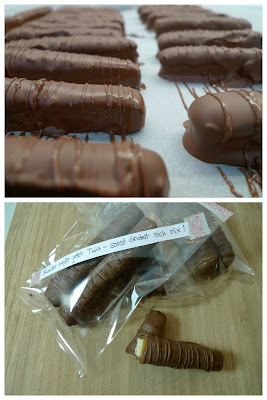 I had found that I get just the original Twix-length if I cut the dough in the mold in half once. Line the mold with baking paper - I draw box shapes around the bottom and the walls of the mold on baking paper, then cut the corners to make it then fold along the edges of the mold. Prepare a pastry dough from ​​of butter, sugar, flour and the egg. Press the dough into the mold and smooth it out. Prick the dough with a fork so that it bakes evenly and the air can escape during baking. The readymade caramel cream from the can was sweeter than the caramel in Twix, so I added some salt. It was also softer, but I was not sure if boiling it down would work, so I've left it that way. Well chilled, the bar could still handled well enough. Pour the salted caramel cream onto the baked base and set to cool for a few hours in a cold place or (faster) in the freezer. Melt the chocolate (I did this directly in a pot on the stove on low heat, but please be careful that nothing burns) and cover the bar with it, set to cool on baking paper. With the remaining chocolate you can still pipe lines onto the bars (there will still be some leftover chocolate, so you do not use the whole 600 g). Let the bars become firm, then they bars can be packaged, (of course, always in pairs!) And off goes the mail from my kitchen!